The first session of Ohio’s Best Basketball League (O.B.B.L.) has come and gone, as the teams left Cincinnati with a great weekend of competition in the rear view mirror. Teams like Ohio Stampede 17u, Ohio Gators 17u and Elite Basketball Club 16u proved that they can play with anyone, while top programs Ohio Phenoms 17u, Ohio Varsity 17u and Ohio Basketball Club 16u & 15u showed the rest of the league that they wouldn’t be taking anyone lightly. Here’s a look at some of the individual stars from the first session, and who to watch for heading into the second session next month in Cleveland…..
Kash Blackwell – ’13 SF Cleveland Shaker Heights (OBC): Blackwell is prep school bound, and playing with a new level of aggressiveness that we haven’t previously seen from him. The 6’5 wing is a versatile offensive player that can play multiple positions, defends well and has some toughness. Look for Blackwell to be sought after by several postgrad schools because of his athleticism and defensive abilities. 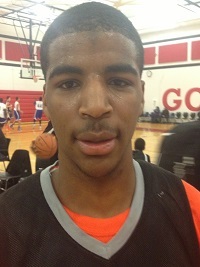 Tysean Powell – ’14 PF Cleveland Benedictine (OBC): The 6’6 Powell is one of the top athletes in the junior class in Ohio. He plays with a high motor, has a build that should easily be able to add muscle and doesn’t mind getting physical. Powell still has a ways to go in developing his ball-skills, but he rebounds it well and finds ways to score in transition, the offensive boards and off of dump off passes. Nate Harris – ’14 PF/C Toledo Central Catholic (Ohio Phenoms): Another super athletic post player, the 6’7 Harris is one of the top defensive big men in the state with his combination of athletic shotblocking and his high IQ that comes from playing in the disciplined Toledo CC system. A great floor-runner, Harris has really added to his offensive game, showing more than just the ability to finish with dunks. As he continues to find ways to score around the basket, more and more mid majors will come calling. Willie Green – ’14 SG Dayton Dunbar (Ohio Phenoms): A versatile offensive player with a knack for scoring the ball, the 6’2 Green has a chance to be one of the breakout players on the national level in AAU this spring and summer. He’s a tough competitor with great length that will really defend the ball, and effortlessly finds his way to the rim off of the dribble, especially in transition. Green’s recruiting is really picking up, and if he finds ways to make perimeter shots consistently the sky is the limit. Ty Hairston – ’14 SG Columbus Northland (Ohio Varsity): Everyone knows that Hairston can be one of the most explosive scorers in the O.B.B.L., but the key for him will be consistency. Over the weekend, Hairston found that consistency as he knocked down jumpers from behind the arc (one of his specialties), attacked the rim for layups or assists and led his team to four wins. A very emotional player, if Hairston has his focus on scoring and defending in April then he’ll really impress some college coaches on the circuit. Aundre Kizer – ’14 SG/SF Toledo Bowsher (Ohio Gators): The 6’3 wing is an explosive athlete that can score in bunches, evidenced by multiple games of over 20 points on the weekend. The Gators guard was one of the biggest reasons why his squad finished 4-1 on the weekend in the 17u division, and are now going to be one of the most feared teams in the league heading into the next two sessions of league play. Kizer will be one that TDP will have a close eye on as the league continues to play itself out. Khalil Iverson – ’15 SF/PF Columbus Delaware Hayes (Elite Basketball Club): Iverson is a bit of a tweener right now, as he’s not quite skilled enough to be a pure wing but not quite tall enough at 6’4 to be a pure power forward; but he’s a big time scorer around the basket. When Iverson has hit motor running he’s one of the most efficient scorers and rebounders in the O.B.B.L. because of his length, athleticism and strength around the basket. He can drive it from the high post, and is able to score on multiple efforts even against taller opponents with his ability to get off the floor on a second jump. As he adds to his skill-set, Iverson could make a big jump in the TDP prospect rankings for Ohio’s 2015 class. Elijah Pughsley – ’15 PG/SG Lima Shawnee (Hidden Gems): On Saturday night, Pughsley torched the nets at Hughes High School, connecting on 13 three-point shots en route to a 45 point and 8 assist outing as Hidden Gems fell to Ohio Basketball Club. The scoring point guard, who could end up at Lima Senior next year, misses his sophomore basketball season at Shawnee, but showed very little rust in his return to the court. Pughsley is capable of creating a shot off the bounce whenever he wants, and has a solid stroke that he can put through the basket from as far as 25 feet out; making him one of the league’s most dangerous offensive players in the 16u division. Lloyd Chatman – ’15 PG Columbus Reynoldsburg (Ohio Varsity): The tiny point guard lacks size but makes up for that with heart and skill, as he strung together big scoring game after another. A quick guard with a knack for creating space off of the crossover, Chatman is a streaky shooter; but when he gets it going defenses better watch out. TDP wants to see Chatman continue to expand his assist game, but he’s unquestionably one of the most dynamic scorers in the sophomore class. Craig Randall – ’15 SG Youngstown Girard (OBC): Randall had a big weekend shooting the ball for the OBC 16u team. He has deep range, very good mechanics, shoots it with consistency and is above all confident; showing the ability to spot up or hit shots off of the dribble. A long guard with a smooth handle, Randall showed an ability to score off the dribble as well, establishing himself as a prospect to keep a close eye on future sessions of the league. Devon Robinson – ’15 SF Cleveland John Adams (OBC): Robinson is an athletic wing forward that doesn’t have a true position yet, but gets things done on the court by out-muscling and outworking his opponents. Very strong for his size, and skilled enough to find ways to score in the mid-range and closer, Robinson is going to be one of the more dangerous inside-outside scoring and rebounding prospects in the 16u division in the league. If he continues to show more advanced skills on the offensive end, he’ll have a chance to be OBC’s breakout player in the 2015 class. Jaevin Cumberland – ’15 PG Wilmington (Ohio Phenoms): Cumberland is another scoring point guard, and like the others was one of the most dominant players in the 16u division of the O.B.B.L. this past weekend. A very good three-point shooter, who plays with a smooth handle that allows him to create shots, Cumberland is becoming known for being one of the tougher competitors on the circuit. This could be a breakout spring for the sharpshooter, as his combination of strength, skills and IQ are what colleges love in a point guard. Nick Ward – ’16 PF/C Columbus Gahanna Lincoln (Nova Village): Ward is a super skilled big man who has a ton of upside in the 2016 class. The 6’6 post has a wide frame with strength but has trimmed down significantly since the fall to become more mobile in running the floor. Ward can score around the rim with his back to the basket, face-up and put it off the backboard with touch, and plays hard on the glass. As the season progresses, Ward should improve greatly playing up in the 16u division of the league; and he could easily establish himself as one of Ohio’s most promising big man prospects. Jarron Cumberland – ’16 SG/SF Wilmington (OBC): Cumberland was the most efficient scorer in the entire league this past weekend, showing a mature game for someone who is still in the ninth grade. Simply too big and strong for opponents his age on the wing, Cumberland has the ability to bully defenders and score around the basket, or knock down a perimeter shot with very good mechanics. When the year is over, it is very conceivable that Cumberland could be one of the top prospects in the 17u division of the league, as he spent time on Sunday playing up with the big boys on OBC’s junior team.